But you can send custom OSC message (see bottom of SimpleSync), so there are compliant with Millumin V2/V3. More info in the documentation. SimpleSync allows you to synchronize several machines. It sends an OSC message to all the machine to they start at the same time. simplesync work fine, tested with 2 instance of millumin. i send scale,opacity and rotation value and it take every value correctly. tested on a home wifi. It start to loose frame since the beginning of clip. Did you use Wifi or Ethernet connection ? If you Wifi is bad, the signal won't be synchronized. With Ethernet, no problem. When you say "loose frame" : did you mean "they didn't start at the same time" ? I used wifi connection for now, tomorrow i can create a lan for testing. When i say "loose frame" i mean that they start at the same time but they loose frame during the playing. What do you mean by loosing : a delay between the different machine, or videoframe that are not displayed ? Sorry for these question, but I've to understand to fix this. I mean exactly a delay between the two machines that cames during the playback. Ok. Try with an Ethernet (LAN) connection. It shoudn't be the case any more. Today ill give it a try. Then i could tell you more. oooh this is a dream that became reality! now i will try to create a desktop interface to control many millumin machines (with 6 out ;) through osc. On my side, I'll see how to improve SimpleSync. For the moment, it's just a simple order "play" that's send to all the machines. Because it's using OSC, it's done via UDP. It should be better via TCP. I'd like to implement a small "test connection" button as well. is there a OSC command to send full screen all millumin's machines in the network? No but that's a very good idea ! Sounds great. A very useful tool! news about the osc command for toggle fullscreen? Worked well for me with two machines. + macbook pro or mac pro. this can be a very good solution to distribute a project between several machines! 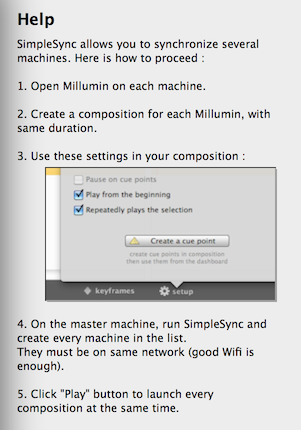 Think implement Sync into Millumin ? Yes, SimpleSync is an experiment and should be included in Millumin sooner or later. But first, I'd like to be able to use timecode (SMTPE and MIDI) to synchronize perfectly. can someone post a guide/tutorial on how to used the SimpleSync. Did you click on the "?" button : you go a small tutorial directly inside the app (see image below). Check that "Listen" is activated and the port is "5000"
Click on PLAY button ! Hope it helps. Be sure to checkout this tutorial to understand better the OSC messages. I was trying the SimpleSync today. I would like to share some thoughts with you. As a feature ooks really promising and interesting, but i notice that after some loop cycle the sync between the two computer I used ( macbook pro retina, iMac connected on LAN) it's different ( after 15 cycles, the difference was more around 1.5 seconds ). I guess you are using the OSC message only to give the play the first time, and then the movie is looping on every machine. But according to my knowledge every computer process the video according his own frame buffering, that is different for every machine, so with only the first play commanded by the OSC is not a real sync, am I wrong? I guess this is why you was talking about using the SMTPE? You're right : SimpleSync synchronizes the OSC orders, but it doesn't send a clock signal (such as a timecode). However, every movie and composition in Millumin is processed depending on the computer's clock, so it always stays synchronized if all computers run at the same speed. It means that you need to use the same computer model (with the same processor) : if not, the computers won't run at the same speed, and computer's clock will be different (so the movies). Using an external clock, such as timecodes, is another solution. It's planned, but I don't have a released date to give you. Sorry. I understand. I didn't think that using same computers could give that result. If I have a 12 core Mac Pro tower (dual 5770 cards, 3 outputs each (6 total), all with different images). With 2 copies of Millumin running on the same with each addressing a different video card, how do I control both universally so they start and stop in sync? I need everything to be in sync and frame accurate. Whats the best way to do this. This is for a commercial, so we will be starting and stopping, and resetting often. Also whats the best way to create a global new in point for all the clips (since they all need to be precisely in sync). Yes, using one instance of Millumin per graphic card is better (because of hardware limitation, not because of Millumin). Set up OSC, so the 1st instance listen on port "5000" and the 2nd listen on port "5010"
In SimpleSync, create 2 machines, then change the port of the 2nd machine to "5010"
there's something about the SMPTE advance? I'm in a project that uses artificailes fires and would be the way to synchronize.